The "Praza de Lena" is another one of Pontevedra's attractive and historic plazas and is located in a particularly appealing part of the town's old district. The square gets its name from the merchandise that was once sold there, namely timber (lena), but today has a thriving cafe culture in both the square itself and the streets that lead into it. To the right is a photo of the "Praza de Lena" (square) with its stone cross or "cruceiro". 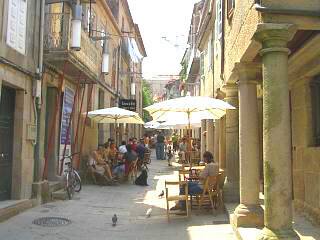 In the center of this small square is a sixteenth century Galician "cruceiro", or stone cross, and immediately opposite is a narrow passageway with a small archway running above. In modern day Pontevedra all signs of the timber trade have now left this area, but it remains a hive of activity with some of the most frequented bars and cafes in the whole of the old town. Here is another photo of the busy cafe bar area around the popular "Lena" square, although this street is more narrow than most. 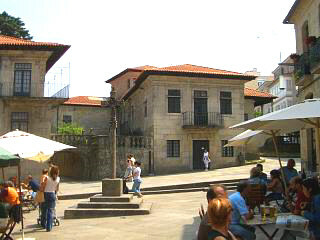 Two of Pontevedra's other famous squares are the Teucro Plaza and the Ferreria Plaza. 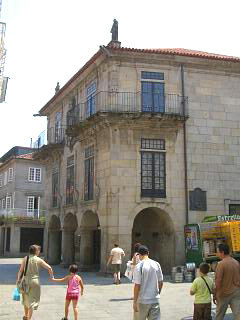 Just a few metres away from the "Praza de Lena" you will find the first of Pontevedra's five museum buildings. We believe the photo to the right to be one of the museum structures. The museum complex was foundered in 1927 and two of its main sites are right next to this square, namely, the former houses of "Jose de Castro y Monteagudo" and also of "Garcia Florez". Both are baroque in style and were built in the eighteenth century. 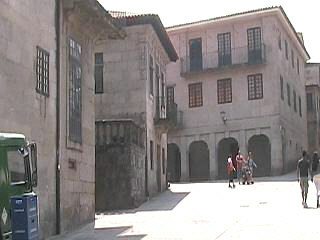 The remainder of the museum's buildings are the "Sarmiento" and "Fernandez Lopez" buildings along with the ruins of San Domingos church adjacent to Pontevedra's alameda. What's on display in the museum of Pontevedra? The three main museum buildings have a mixed and varied list of artifacts which I must confess we were unable to slot into our visit of Pontevedra. That said, I can give you some idea of what you can expect to see, although not in which building you can expect to see them. Firstly, there is a large collection of items in the form of art and literature that came from one of the museums founders, "Alfonso R. Castelao". "Castelao" is hailed as the father of "Gallegoism" and is a hugely significant figure throughout Galicia. "Castelao" was, during his lifetime, a successful writer, artist and politican. He was born in "Rianxo". What to me sounds fascinating, is a museum reconstruction of one of the rooms of the 19th century frigate "Numancia". This was the first battleship to circum navigate the globe under the command of Admiral "Mendez Nunez" and a partial internal replica has been recreated with furniture and other items of the period. Silverware makes up a large part of the museums collection, some of it donated by private holders and engravings and "jet" are also among the many exhibits. The museum also has rooms dedicated to specific artists and art work, ceramics and paintings representative of both Galicia and Spain. Stone monuments including coats of arms and tomb stones are on display at the ruins of San Domingos.